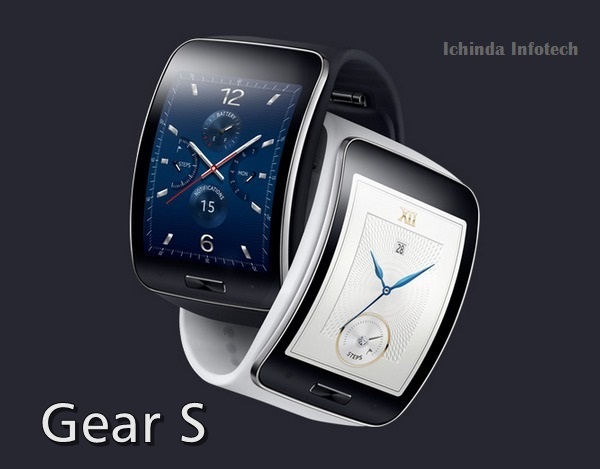 Samsung has launched it’s next generation 3G smart watch Samsung Gear S in Indian market priced at Rs. 29,500 in Black and White colour variants along with Gear Circle priced at Rs. 8,500 and New Galaxy Note 4 priced at Rs 58,300. Which first unveiled at ahead of IFA 2014. It will lock horn with Apple iWatch and LG G Watch. The all new Samsung Gear S is a IP67-certified dust and water resistant smartwatch supports Single SIM(GSM), Nano SIM, Bluetooth 4.1 and Wi-Fi connectivity runs on Samsung’s own Tizen operating system with heart rate sensor and four pogo pins comes with a 2-inch curved Super AMOLED display with a 360×480 pixel resolution powered by a dual-core 1GHz processor with 512MB of RAM, 4GB internal memory packed with a 300mAh Li-ion battery promising 2 days battery life. It also allows you to read notifications like messages, social networks, calendars and other applications without connecting to your smartphone. It also offers you S Voice, S Health app and turn-by-turn pedestrian navigation via Here Maps. At last few honest word that the all new Samsung Gear S is going to revolutionize your multi-tasking. What you think? Please be open to give your view.